WHAT IS AN ELECTRICAL COMPLIANCE CERTIFICATE (“ECC”)? An Electrical Compliance Certificate (ECC) is a certificate which certifies that the electrical installation in your home is safe and complies with the minimum standards set in legislation. Every homeowner must have a valid ECC in respect of the electrical installation. The seller’s obligation to deliver an electrical compliance certificate arises from two sources. The first is the sale agreement and the second is the Electrical Installation Regulations, which regulations were published in May 2009 pursuant to the provisions of the Occupations Health and Safety Act (OHSA). Most standard property sale agreements will have a clause that states the seller must obtain an ECC when the property is sold. When the seller delivers an ECC issued by a suitably qualified electrician, this ECC is prima facie valid. In other words, the ECC is assumed valid until invalidated by a competent authority. In terms of the regulations the owner of a property may not allow a change of ownership if the ECC is older than two years. The ECC must be in the format as set out in the new regulation and must be accompanied by a test report. If any renovations or alterations have been done after the ECC was initially issued, a new certificate must be issued, alternatively a new certificate must be issued for that part of the property where the work was done (even during the two year validity period). 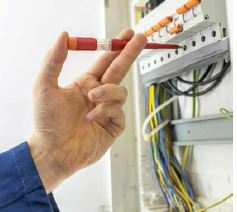 If a purchaser experiences any problems with regards to the electrical installation on a property after registration of transfer, there are a number of remedies that can be followed. What is suggested below is in addition to the purchaser’s right to approach an independent attorney / advisor for advice. In all instances it is suggested that the purchaser act as quickly as possible after discovering / experiencing the faults in the electrical system. A delay in acting to enforce the purchaser’s rights could prejudice the purchaser’s prospects of success. Purchasers should not make any alterations to the electrical system or renovate until the dispute is resolved. The purchaser can contact the electrician who issued the original certificate in order to look over any issues that have arisen. It is suggested that this be done in conjunction with the seller and the transferring attorney inasmuch as the electrician was originally instructed by the seller. The purchaser can contact an independent electrician to issue a report on the faults being experienced. This report can be passed on to the seller directly or through the transferring attorney with a view to an amicable resolution. The costs of such independent assessment will be for the account of the purchaser. The purchaser’s ultimate remedy is to refer the matter to an Approved Inspection Authority (“AIA”) appointed by the Department of Labour. The AIA will on request and for a fee, of approximately R2000.00, payable by the purchaser, visit the premises and inspect the electrical installation and determine the extent to which there is non-compliance with the regulations. A report is issued after inspection to indicate the installation as being compliant or non-compliant. The report is forwarded to the electrician who issued the certificate and the electrician is provided an opportunity to remedy the non-compliance and issue a new ECC. The AIA will repeat their inspection and confirm whether the installation is compliant. The re-inspection will also attract a fee of approximately R2000.00. If the matter is not resolved, same can be referred to the Department of Labour who may issue a probation notice to the electrician. If after the non-compliance notice is issued, the seller fails to deliver a compliant ECC to the purchaser, he remains liable and in breach of his obligations set out in the OHSA.